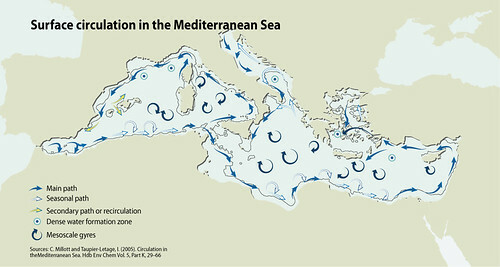 The large-scale circulation of the Mediterranean Sea has been described as sub-basin-scale and mesoscale gyres interconnected and bounded by currents and jets with strong seasonal and inter-annual variability (Millot and Taupier-Letage 2005). This general circulation flow impinges on the coastal regions and strongly influences the local dynamics of currents. 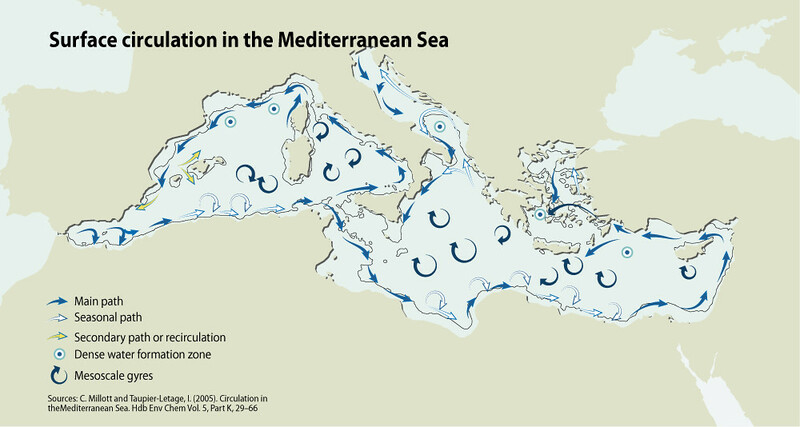 Shelf areas in the Mediterranean are comparatively small and are separated from the deepest regions by steep continental shelf breaks. This configuration makes possible the intrusion of the large-scale flow field on the coastal/shelf areas and the direct influence of the large-scale currents on coastal flow. Transport of material from the coastal areas to the open ocean is enhanced by this mechanism, with important consequences for the maintenance of the ecological cycles in the basin (EEA and UNEP 1999) and for the potential for redistribution of pollution from land-based sources.